So this is my first year having my students do journals. I’ve heard of it but have never actually seen it done in a preschool class. I knew right away that these journals weren’t the typical “have the child write about something and draw a quick picture.” I wanted to try it. 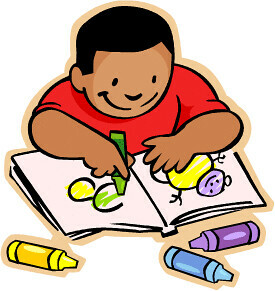 I made my journals from plain white copy paper – they color with crayons, and write in pen or pencil. What we started doing at the beginning of the year was have them draw a picture – anything they wanted – and then they would tell one of us what it was and we would write it down for them. We also had them write their name – or at least try to write their name – everyday in their journal. This went well. After a couple months of this routine, we started to sound out the words as we wrote what they had written. We would say the letter we were writing and the sound it made. We did this until Christmas break. In January, we had them take the pen from us and we walked them through sounding out and writing the words for themselves. It’s been going well since then. I would love to see them do this for themselves (at least the ones who I think are ready) but they just don’t feel confident doing that without one of us sitting right there with them. But it would be nice to see them try to write words on their own – hopefully they will soon. Anyway, I got to wondering how many other preschool teachers journal in their classroom? What does it entail? What’s the process? I’d like to hear what other teachers do and what has (or has not) worked in your class…feel free to leave comments because I am very interested! 🙂 I’m always open to learning new ideas! You have a very similar system to ours. I have done it every year and am always surprised at the writing gains they make by the end of the year. This year we have made it a workstation in the morning so that one group of four writes in their journals with a teacher there to take dictation, sound out words for those who are ready, etc. We also use this time to try and get the kids to tell a story using the picture they drew. I will usually model this daily at the beginning of the year. we do daily journal work too. ours is a combination of free time work (coloring, drawing, writing, scribbling) and guided time…draw circles and make sure they are all touching. i need to take photos of their work, it is fun to see. http://www.pre-kpages.com/journals.html When we re-vamped our program last year we switched to the writing workshop method. I highly recommend reading Already Ready by Katie Wood Ray for the most up to date research on writing in the early childhood classroom- it’s a fabulous book with lots of examples of real student work. I was hooked after reading it, now our students are writing actual books! We never dreamed this was possible. I would have loved to see your page on journals – however the link doesn’t work! It takes me to a page that says: You have reached a page that is outdated. Then it gives me another link to try but sadly that one does not work either! Too bad! I will have to look up the book you recommended though – sounds interesting!